Turkey has raised the customs duties applied on PS imports from developing nations to 3% as part of a series of decisions regarding the country’s import regime made by the cabinet, according to the official gazette published on December 31. PS imports from developing nations were exempt from customs duties before the latest adjustment. With the new regulation, which became effective as of January 1, 2013, any of these cargoes to be cleared from Turkish customs will be subject to 3% duty. In view of this development, Thailand, India and Pakistan are going to be the major sources feeling the impact of the recent upward adjustment in customs duties as they are the main suppliers of import PS in Turkey right after Europe. 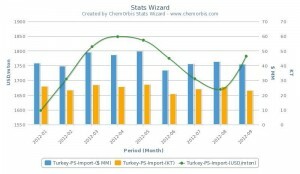 According to ChemOrbis Import Statistics, Turkey’s total PS imports totaled more than 220,000 tons in the first eleven months this year with a total value of around 388 million US dollars. Its main PS supplier was Belgium with more than 100,000 tons of imports in the first eleven months of 2012, accounting for 45% of total imports. The second largest import supplier was Thailand with more than 37,000 tons of imports in the same timeframe. Thailand constituted 17% of the total PS imports in the first eleven months of 2012. It was followed by Pakistan and India with respective imports of more than 9,000 tons and 8,800 tons. On top of the higher customs duties, PS offers from Asia have been at all time highs to Turkey in recent weeks due to soaring feedstock costs. 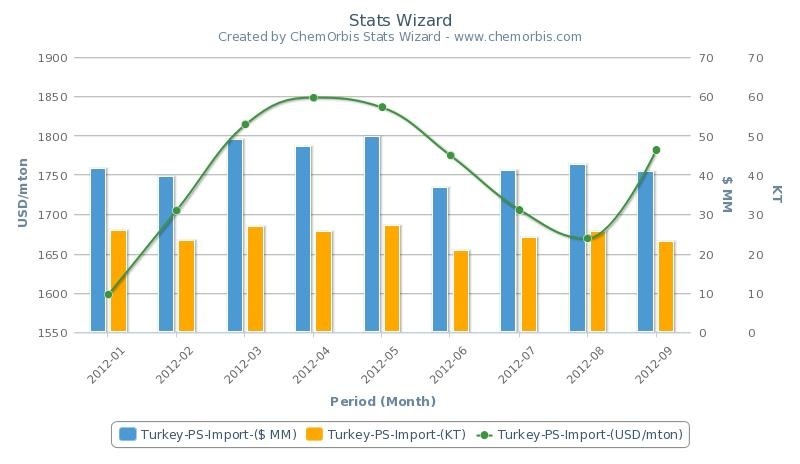 As can be seen from the graph below created by ChemOrbis Stats Wizard, Turkey imported around 22,000 tons of PS on overage per month with an approximate value of around 40,000 – 50,000 US dollars in the first three quarters of 2012. Hence, the total value of PS imports is expected to be higher for the full year of 2012 and early 2013 due to rising PS prices and higher customs duties.